The village is set on the lovely Lac d'Esparron. A small river splits the 12th century village in two, then winds on to the lake. The villa is No. 25 Hameau de la Chapelle. The town square with the cafés and shops is just a few steps on the other side of the house at the end of a little path. The Main Floor of the house is entered from the village, behind the little provencale church (XI°ac) or the terrace from the street down the house. You enter into the "Salon" or main living/dining area. The walls are "South of France" stucco with a high beamed ceiling and terra cotta glazed tiles on the floor. Opposite the fireplace is the staircase that leads up to the mezzanine bedroom. To the right is the living room area with day bed, club sofas, corner fire place and TV Behind this area is the fully equipped kitchen, bathroom with bath tube and shower, and sink, and separately the W.C. ("cabinet de toilette"). The kitchen has generous cupboard space, double sink with drain board, "plaque à induction" with four electric rings, a full size convection electric oven, big refrigerator with separate freezer for food and ice (automatic). It is a fully functional kitchen designed to cook meals on an everyday basis.There are electric coffee coffee makers (Nespresso) and kettle, a toaster and a wide assortment of pots and pans. The Downstairs Bedroom is reachable by the inside staircase or the outside staircase and its fully private from the rest of the house. It is equipped with its own "cabinet de toilette" with shower, sink and W.C. This room is almost a "studio apartment". 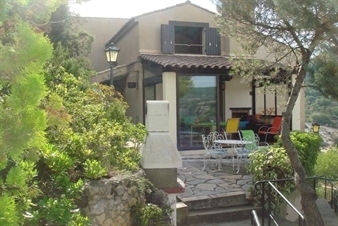 It has a large French window with a view on the lake and marina. It has a double bed and a huge wardrobe. A small TV set and dvd reader is on the wall. Perfect for independently minded family members or for two couples who like their privacy. Due to space restrictions in the kitchen, the washing machine front loaded is in this bathroom. The Main Terrace and the veranda on the ground level are large and receives full morning and all day long sun. The veranda is a nice place to be when windy or rainy. It is equipped with patio table, chairs and a big cupboard. There is a secure, fenced, terraced garden with mature trees and rock plants plus a a barbecue. There is a street private hedge that gives the garden and terrace privacy.